The House offers a programme of regular events that encourages exploration of the contemplative tradition. All groups are open to anyone who might be interested. Tuesdays: 3 – 5pm Open afternoon. A chance to meet people and get to know the House. Enjoy the garden, browse in the library, have a cup of tea. All are welcome. people may come and go quietly as they wish. Wednesdays: 7.15 – 8.45pm. 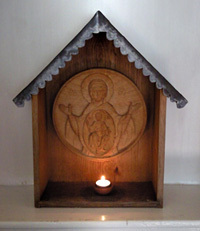 Centering Prayer - every week, beginning 11th January. For details call Jacqueline on 0117 973 4136. Those new to centering prayer are recommended to come on the 1st Wednesday of the month. Just come; no need to phone first. A chance to meet people and get to know the House. Enjoy the garden, browse in the library, have a cup of tea. All are welcome.